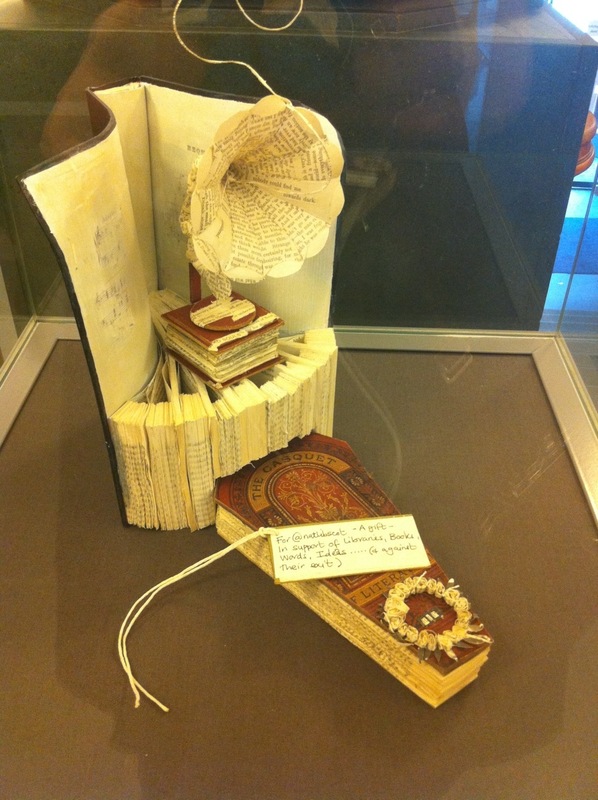 In literary Edinburgh, a story is unfolding, created from the pages of books and pieced together lovingly by unknown, artistic hands. 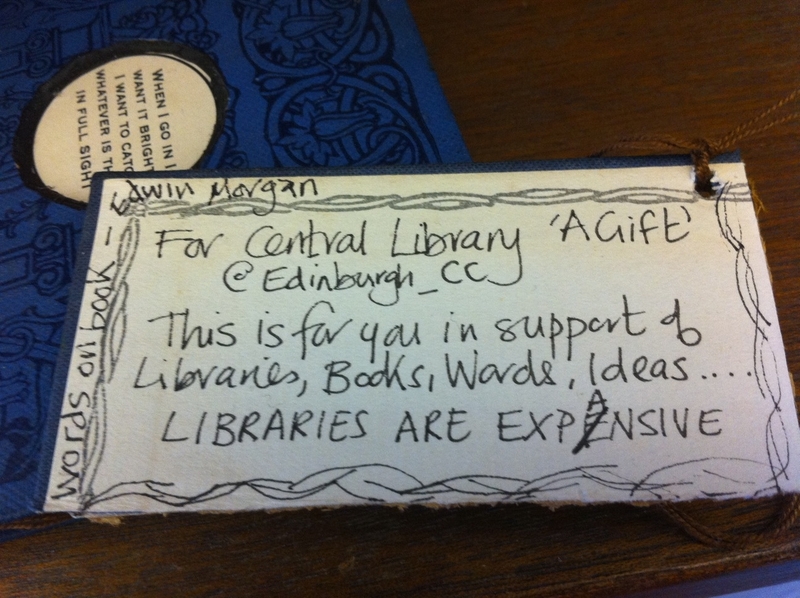 We have no idea who is creating these treasures, but would like to thank them for all they are doing to support libraries, books, words and ideas – and a personal note of thanks for giving one to @EdinCityofLit. It has made my literary year. I’m working with the other sculpture recipients to bring them all together for an exhibition, so that others can marvel at these delicate artworks. 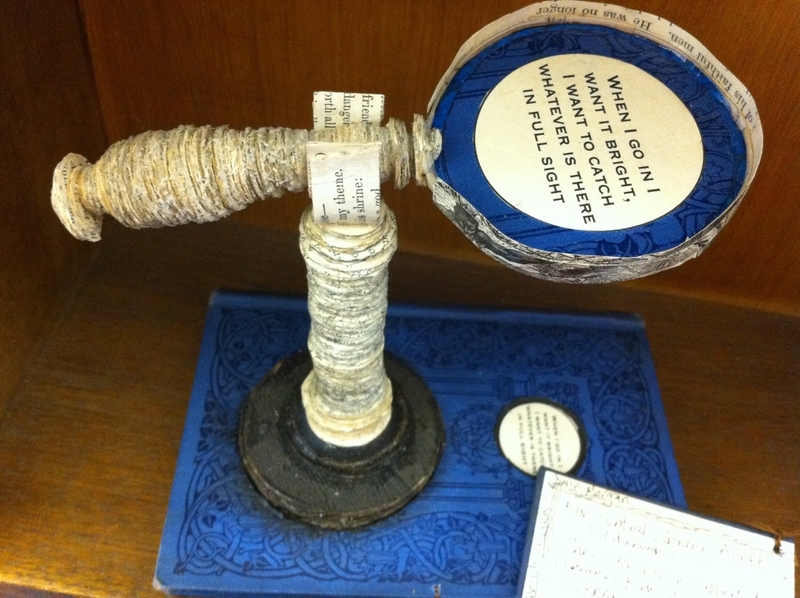 In June, the National Library of Scotland received a sculpted gramophone, made from the pages of Ian Rankin’s Exit Music. The whole sculpture is a visual interpretation of the two words of the title: the gramophone for music, and the coffin for exit. The tag says that they support libraries, and are against their exit. There’s a further Ian Rankin link: the coffin could be a reference to the tiny coffins found on Arthur’s Seat and housed in the National Museum of Scotland, a display that inspired an earlier Rankin novel. Once upon a time there was a book and in the book was a nest and in the nest was an egg and in the egg was a dragon and in the dragon was a story….. Deep inside the branch-carved pages of James Hogg’s Confessions of a Justified Sinner sits a lonely figure, a raven perched next to them. 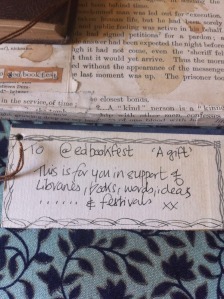 The Edinburgh International Book Festival’s gift was found on a signing table, sat amidst the hustle and bustle of the Bookshop tent. 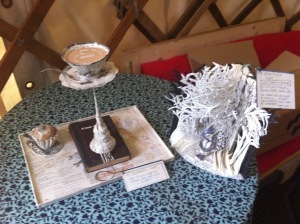 On the specially papered tea tray sits a cup and saucer, resting on a Good Book and with a cake close by. There’s even a reference to the Scottish Poetry Library: the tea bag is full of tiny letters and reads ‘By Leaves We Live,’ the name of the SPL’s Twitter account. These sculptures are clearly in support of our ‘expansive’ libraries, championing them in the face of the financial pressures. Libraries are our access to written worlds and great knowledge, to stories and to new ideas. 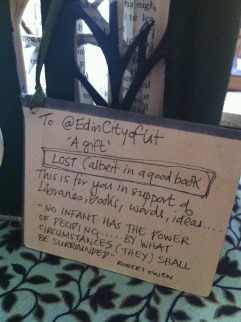 My thanks to Alex for emailing to let me know: the librarians had found the sculpture but didn’t know about the other gifts. Literary Paparazzo Chris Scott has taken some stunning pictures of the sculpture, including this one taken as I introduced Ian Rankin to the City of Literature’s sculpture. 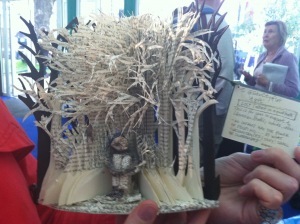 My colleague Ali and I found our sculpture during the Edinburgh International Book Festival. 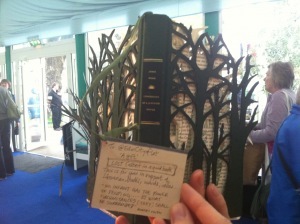 I was blogging daily – you can read my post about EdBookFest Day 12 and the discovery of the sculptures. Ali and I had a chat with the Guardian about the exciting discovery. STV News ran a piece about the sculptures on the nightly news.